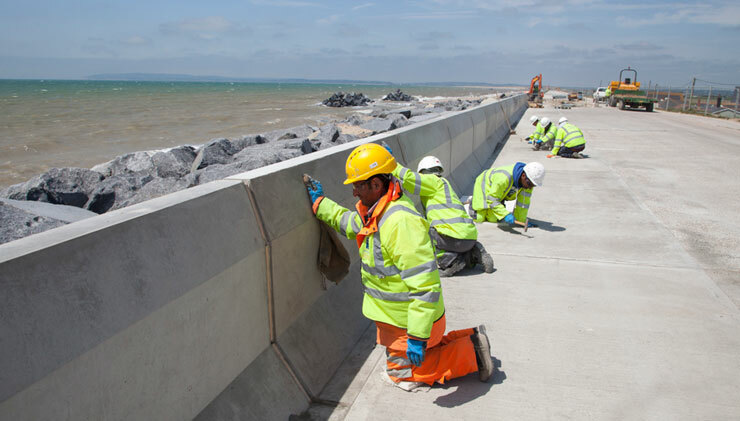 The £30m Broomhill Sands Coastal Defence Scheme, delivered by Team Van Oord, has been named a winner in the 2016 Environment Agency Project Excellence Awards. The Project Excellence Awards recognise excellent project work undertaken by the Environment Agency and its partners. Broomhill Sands has been named winner of the ‘Innovation’ category. For 2016 there were 60 individual projects entered across the seven categories, making a total of 96 submissions. A pre-selection panel shortlisted three projects in each category for further judging. As well as wining the Innovation category, Broomhill Sands was also shortlisted in two other categories: ‘Programme and Project Delivery’ and ‘Efficiency’. Located at Camber Sands in East Sussex, the Broomhill Sands scheme provides improved protection from the risk of flooding for around 1,400 homes and more than 100 businesses. The scheme has increased protection from one in 20 years to one in 200 years, taking into account predicted sea level rises. 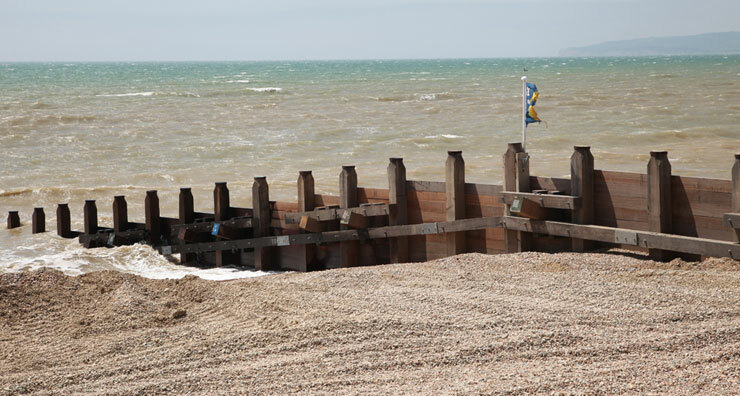 The works extend across 2.5m of beach and include: a 1.8km length of rock revetment requiring 265,000 tonne of rock armour and a new concrete wave wall; recharging 700m of shingle beach and replacing the existing timber groynes; and widening and improving the existing access way along the top of the sea defences, including pedestrian access steps and ramps down to the beach. The Broomhill Sands team led on a number of innovations which are ‘firsts’ for the Environment Agency, the UK and even in some instances for the construction industry itself. The scheme features groyne planks made from recycled plastic (see pic below) and a long-term trial has been set up to monitor the success of this. The use of recycled plastic in this way has the potential to significantly reduce the carbon footprint of sea defence projects. There is currently no industry guidance relating to the safety of the public and coastal rock armour structures. To address this, the Broomhill Sands team developed a technical specification that covers void ratio, rock interlocking, panel densities and rock sizes. They also developed the concept of a ‘welcoming void’ and created pathways up from the beach in a bid to deter the public from climbing onto the rock revetment. The frontage at Broomhill Sands is one of the UK’s most popular kite sports locations; up to 200 kite surfers can be in the water at any one time. To overcome the significant challenge of managing the interface between the kite surfers and the works, the project team developed a safety system which is now considered to be an example of international best practice. Maurits den Broeder, Chairman of Team Van Oord, said: “We are naturally very pleased and proud to have won this award and I’d like to congratulate everyone involved with delivering this fantastic scheme. “In making this award, the Environment Agency has recognised the project team’s outstanding efforts to break new ground and pioneer new solutions. The Broomhill Sands team will receive its Project Excellent Award at a ceremony hosted by the Environment Agency on 24 February. Footnote: Broomhill Sands also won the 2016 Environment Agency Exemplar Award which is presented annually to recognise outstanding health, safety and environmental performance.